Lloyd and Marian Michael have shared a lifetime together, and it’s been more than 70 years since the high school sweet hearts got married in 1942. Their special bond has resulted in four children including their son, the Rancho Cucamonga mayor Dennis Michael, eight grandchildren and five great grandchildren. But our story begins when they first got married. Shortly after they walked down the aisle, Lloyd shipped out with the Army Air Corps and spent more than two years in Europe during World War II. During the time they were apart, they wrote hundreds of letters back and forth. 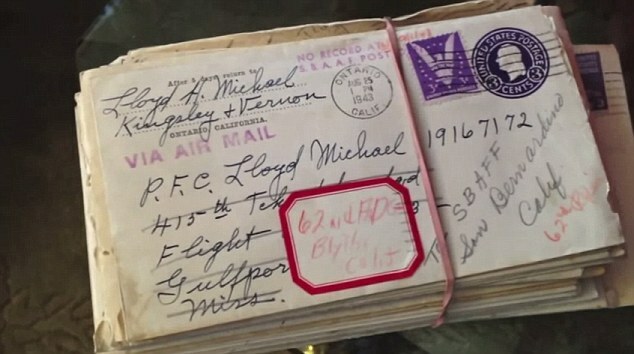 After Lloyd returned from the war, those letters remained a sentimental symbol of their love. They moved to the Rubio Ranch in Alta Loma and started a family where the letters were stored in a trunk in a shed on the property. The letters stayed there until a day in the late 1960’s when there was a break in and burglars made off with the trunk and a number of other items. Those love letters, mementos of those difficult early years when they were apart, seemed to be gone forever. What happened next can be seen as borderline miraculous. In 2012, more than 40 years after those letters had disappeared, a stranger called with a startling message. The stranger had found the letters among his deceased father’s belongings. Speculation is that he obtained the letters at some point to enhance his stamp collection, but there is no definitive evidence for this. But for Lloyd and Marian, why he had the letters doesn’t matter. They are simply happy to have their precious letters back, although they do bring back bittersweet memories. The couple can only read a few at a time, but difficult or not the letters reinforce 70 years of marriage between the two, which is a feat few can ever hope to accomplish. For the full story on the miraculous surprise, watch the clip below.